Directed by Luis Hernandez, Real Women Have Curves focuses on the story of Ana, the teenager who dreams of leaving behind her family in an East Los Angeles barrio for a better life. When accepted to attend Columbia University, Ana must come face-to-face with her family’s financial struggles and is forced to stay home and work in a tiny sewing factory. Much to her surprise, she gains valuable insight on love, life and solidarity from four fellow Mexican-Americanwomen who share the same struggles, dreams and aspirations for their lives. As the days pass by, the five women share in camaraderie as they too battle the hardships of the Latina immigrant experience and gender politics. The play’s success inspired the 2002 American movie starring America Ferrera, directed by Patricia Cardoso and produced by George LaVoo, who co-wrote the coveted Humanitas Prize screenplay with Lopez. The debut of the film at the annual Sundance Festival in 2002 won the Audience Award, as well as Special Jury Prizes for actors America Ferrera and Lupe Ontiveros. The screenplay was also selected by the National Board of Review for Special Recognition for Excellence in Filmmaking. 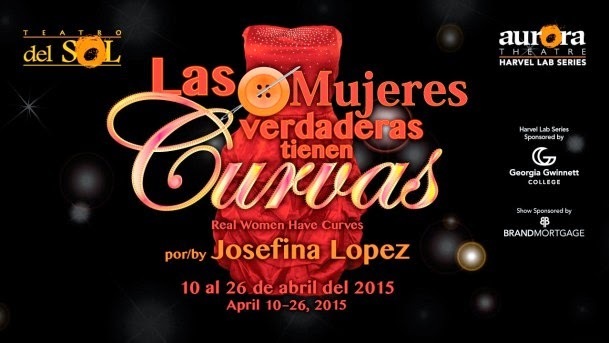 Recommended for teens and adults interested in culture, Real Women Have Curves plays the Aurora stage April 10-26. Tickets may be purchased for $20-$30 per person online at tickets.auroratheatre.com or by calling the Box Office at 678-226-6222. On Thursday, April 9, Aurora Theatre will host a Community Conversation from 6:30 p.m. - 7:15 p.m. with a panel of experts discussing the Economic Impact of Immigration: Do Facts Matter? Admission to the event is FREE for anyone who wishes to join the conversation. Tickets to the post-conversation performance are currently on sale and subject to availability.